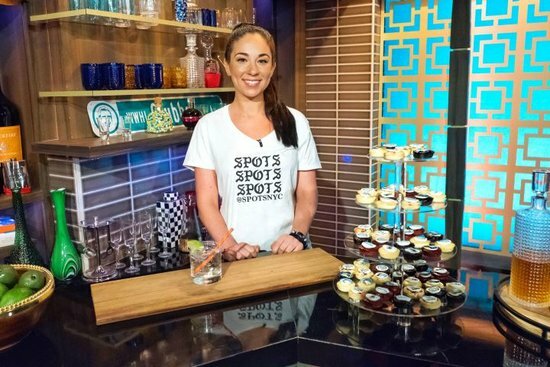 Our first feature in our Women’s History Month Series is Lily Brynes, the founder and CEO of SPOTS NYC! These delicious, customizable mini cupcakes come in four different flavors: birthday cake, brownie batter, red velvet and vanilla. Each cupcake contains an edible logo or message, making them exactly what you need for your next happy hour, pitch meeting or birthday party! In 2014, my now-fiance, Samson and I, decided to ditch materialistic Valentine’s Day gifts in exchange for ones with more personal value. After many failed ideas, I got the bright idea to whip out my edible printer and bake some mini cupcakes with our picture on them. I knew the cupcakes would be meaningful since they would be personalized, homemade and delicious. Needless to say, Samson loved them. Shortly after posting pictures of what I was calling “SPOTS” on my personal Instagram account, I found that others loved them too. Following my instinct I made the decision to walk away from my corporate job to pursue SPOTS NYC full-time. I haven’t looked back since! Today, we’ve worked with companies such as Amazon, Google, American Express, Starwood and Target. As well as a handful of celebrities including Ellen DeGeneres, Sarah Jessica-Parker, Neil Patrick-Harris, Mariah Carey and Reese Witherspoon… just to name a few! What is the biggest/hardest lesson that you’ve learned while running a business? How to turn mistakes into an opportunity! It’s inevitable that you will make mistakes (running a business is hard!) but it’s about how you deal with those mistakes that makes you a better leader. For instance, if you handle the mistake in a creative and unique way – your client wont remember how you messed up, they will remember how you went above and beyond to correct the mistake. You have the power to control the narrative! Being a female business owner has been so special. Not only do I feel like I am helping to change the world (lean in, ladies and take a seat at the table!! ), but I also have access to an amazing network of other female founders. When we come together and support each other – there’s nothing that we cant do! It has never been more important to be a strong woman! Working with our company means that you support FoodtoEat’s mission to promote female, minority and immigrant run businesses. Why do you think this mission is important? I think FoodtoEat’s mission is the MOST important thing to support. We need to do everything in our power, especially right now, to make this world a better and more accepting place. Female (and immigrant run) businesses should become the MAJORITY!!! Never stop hustling. Never let anyone get in the way of your dreams (especially a man). Don’t just reach for the stars, reach for the sun!!! Previous Entry:Show Your Appreciation on Employee Appreciation Day!